"There are persons who have not begun to recognize that the classic scriptures and their commentaries constitute personal instructions, and who, therefore, might have the following qualm. Qualm: When you meditate on the path, you should do only stabilizing meditation rather than repeatedly analyzing your object of meditation, for repeated analysis with discerning wisdom is only for times of study and reflection. Moreover, repeated analysis will prevent you from future attainment of buddhahood because conceptual thought apprehends signs of true existence. Proper attention is based upon prior study. Sublime wisdom, which takes reality as its object, arises from your cultivation of proper attention. He draws a parallel between this wrong conception of meditation with the infamous Chinese Ha-shang. As the story goes he lost the debate at Samye Monastery to Indian monks, whereupon it was decided that Tibet would only receive and adopt Indian forms of Buddhism. Whether this debate actually occurred or not is subject to debate, but as far as Tibetan cultural memory goes it happened. Reading this it occurred me that another author of note Cheng'guan 澄觀 (738-839 CE) in the Tang Dynasty (618-907 CE), who lived in the same general era as when the Samye debate occurred where the infamous Ha-shang was brutally refuted, addresses the same issue in a rather small work of his entitled Examining the Five Aggregates 《五蘊觀》 where he outlines the practice of analyzing the five psycho-physical aggregates and in the concluding remarks refutes the same objection that Tsong Khapa does. This is noteworthy because the Samye debate is said to have occurred in the same time period as Cheng'guan was writing (8th century). We can indeed assume that some Buddhist thinkers in China at the time, perhaps those Cheng'guan had in mind, held the view of Ha-shang, but this was by no means a universal view held east of Tibet. I gather that in Tibetan Buddhism the views of Ha-shang are commonly thought of as “Chinese Buddhist views” and hence the whole of Chinese Buddhist thought can be easily dismissed and regarded as essentially defective. However, if we should just imagine that it was the scholar and yogi Cheng'guan who attended the debate at Samye, rather than this notorious Ha-shang character, then the perception of Chinese Buddhism in the general Tibetan Buddhist perspective might have evolved into a more positive image. Fortunately, there has been some progressive development in recent times in clarifying long-held misconceptions between Chinese and Tibetan Buddhist traditions. 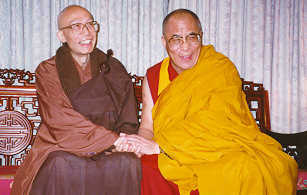 There was a discussion held between His Holiness the Dalai Lama and Chan Master Sheng Yen in May 1998. Their discussion is recorded and translated in the publication Meeting of Minds. In the following quoted section the Dalai Lama notes the probable existence of two Chinese monks active in Tibet in the early history, and points out the source of the long-standing issue that, in general, Tibetan Buddhism has seemed to have had with Chinese Buddhism. He also notes Tsongkhapa's vocal criticism of Chan as he understood it. Earlier today in our private meeting, I was very impressed and pleased to hear that Venerable Sheng Yen once spent six years in solitary retreat. Listening to your presentation of Chan Buddhist teachings, my immediate and very profound feeling was that I was listening to words of wisdom from someone who is very experienced and a great practitioner. For all of us, to have knowledge of Dharma is indeed very important, but perhaps what is more important is to put that knowledge of Dharma into practice. The reason I ask is that there is some historical connection to Chan in the origin and development of Tibetan Buddhism. We know that Lama Tsongkhapa had been one of the most vocal critics of the sudden teachings of Chan in Tibet, and there was a great debate surrounding Chan and the teachings transmitted from Indian Buddhism. However, in the Samye Temple during the formative era of Tibetan Buddhism in the reign of King Tri-song-Deutsen, different wings were devoted to different practices. One section is devoted to the Vajrayana practitioners-the tantricas. Another section is dedicated to the lozawas and the panditas-the translators and the scholars. The third section is called the dhyana hall, the place of meditation. This is supposed to have been the residence of a Chinese master referred to as Hoshang. It was during the eighth century, when Samye was built, that the Indian masters Santarakshita and Kamalashila were active in Tibet and were part of the development of Tibetan Buddhism. Unfortunately, despite His Holiness' positive remarks, I do not foresee much serious interaction between Chinese and Tibetan traditions. I understand that in Taiwan Tibetan Buddhism is somewhat popular and I once met a Kagyu-pa Lama in 2010 when I was visiting the National Palace Museum in Taipei, who told me he was teaching in Taiwan. In the same afternoon I also saw some people handing out anti-Tibetan Buddhist literature, bilingual with Chinese and English, complete with shock images of tantric coupling deities, denouncing this as absolute heresy. The Dalai Lama has also been warmly received in Taiwan before, despite the objections of at least one major Buddhist leader in Taiwan, namely Venerable Xingyun of Foguangshan, objecting to his visits. Still, while individuals themselves might take an interest and even practice Tibetan Buddhism, and there might be scholars who study Tibetan, I don't think an orthodox Chinese lineage would readily absorb many practices from their Tibetan cousins. Although at one point most of the Sinosphere (China, Korea and Japan) had its own form of Vajrayāna developed during the Tang Dynasty, it was eradicated on the mainland and only survives today in Japan with Shingon and Tendai, with small pockets of it also in Taiwan and America. However, it is yoga-tantra, and not being anuttara-yoga-tantra it lacks consort visualizations and practices. The former would be acceptable, but not the latter. Consort practices and even the artwork would not go over well, even for non-monastics, as orthodox Chinese Buddhism tends to be puritanical at times, really stressing celibacy even for ordinary laypersons. This all said, I am speaking of Chinese and Tibetan Buddhism as I understand it outside of the PRC – there might be some positive interaction between the two traditions in provinces like Gansu and Sichuan where you have both Han Chinese and Tibetans living in close proximity to each other. In any case, I hope people can realize the value in taking an ecumenical approach to Buddhism. One need not limit oneself to just one cultural development of Buddhism as there is wisdom to be found all over the world. 1 Tsong-kha-pa Blo-bzan-grags-pa, The Great Treatise on the Stages of the Path to Enlightenment. Volume One. Translated by the Lamrim Chenmo Translation Committee (Ithaca, NY: Snow Lion Publications, 2000), 109. 5Meeting of Minds. Translated by Wang Ming Yee, Geshe Thubten Jinpa and Guo-gu. Edited by Lindley Hanlon and Ernest Heau. Dharma Drum Mountain, 35-38.